In 1919, when Prohibition was signed into law, many people assumed that the definition of “intoxicating liquors” would not include low alcohol beer and wine, therefore, making it legal to manufacture and sell. It is likely that if this had been the case, prohibition may have been a more successful endeavor (notice I said MORE Successful, not ENTIRELY successful). However, the general public, and possibly many “dry” supporting politicians, were misled. 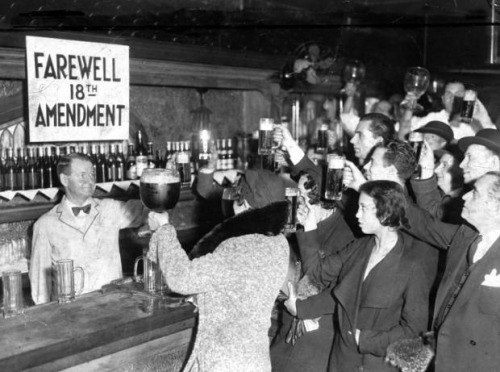 After the passing of the amendment, the Volstead Act was written, and it defined “intoxicating liquors” as anything higher than .05% alcohol, thus making the standard 3.2% beer illegal. 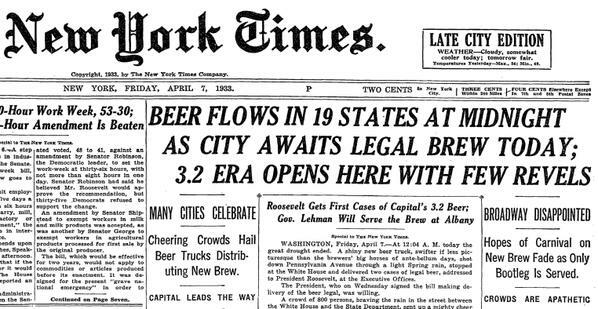 The public was both aghast and disappointed, and President Wilson actually vetoed it, although for separate reasons entirely from making 3.2% beer illegal. When the depression hit, the people began to push for legalization of 3.2% beer. 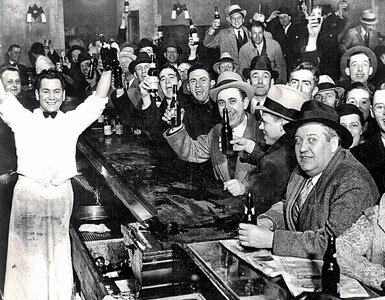 Many people felt that it was their right to enjoy a drink after a long day of hard labor or looking for jobs. FDR and the democrats used the promise of beer legalization to their advantage in the 1932 election, and were successful. The Cullen-Harrison Act was enacted in Congress on March 21, 1933 and signed by FDR the next day. The act legalized 3.2% abv beer, and wine with similarly low alcohol content. The law went into effect on April 7, 1933. April 7 has henceforth been celebrated as National Beer Day.